You may have heard of Dathan Auerbach. The author originally made a name for himself when he self-published his first book after it began as a post on Reddit. His entries on the website's "No Sleep" horror forum were a big hit and went on to become some of the most up-voted posts among the community's twelve million subscribers. Auerbach's GoFundMe campaign received more than one thousand percent of its funding objective, which allowed him to rewrite these entries into a novel titled Penpal. That self-published book garnered enough sales and positive reviews that Blumhouse Books, an imprint of Doubleday, signed Dathan Auerbach to a book deal. They appear to have high hopes for Bad Man, which piqued my curiosity and compelled me to give the novel a shot. 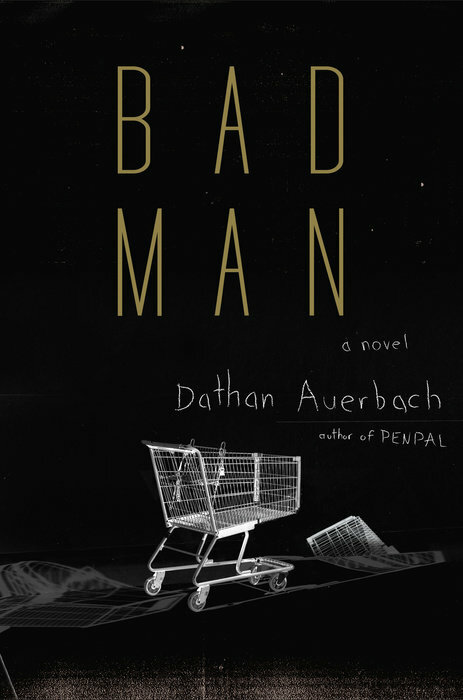 As advertised, Bad Man is indeed a creepy, slow-burn horror book. Some things work extremely well, but at times the execution leaves a little to be desired. In the end, though all the ingredients that make a great read were present, we had to settle for a merely good novel. Which, given the story's potential, was a bit disappointing. If there is one aspect of this work on which Dathan Auerbach has perfect control, it has to be the atmosphere. He sets the disturbing mood from the very beginning and the eerie and troubling set-up engenders more and more creepy imagery with each new chapter. It's particularly true at the store during the night shift, where even the baler feels evil. The suspense and the tension grow as the tale progresses. In terms of setting, the author nailed it right on the head. This is exactly how horror novels should feel like. Ben is a decidedly flawed protagonist and an unreliable narrator. Most of Bad Man is told from his perspective and it works well for the most part. Understandably, the disappearance of his younger brother has profoundly affected him. The more so because he feels responsible and has never truly forgiven himself for losing him. Reading the book, we are never quite sure if Ben is totally honest, or if he is going mad. Given his circumstances, Ben is an easy character to root for. Although he's not the sharpest tool in the shed, his heart is in the right place and he means well. Having no friends, his relationships with Marty and Frank, the two other graveyard shift employees, become especially important. The supporting cast is comprised of markedly flawed men and women. In their own ways, they all have their secrets and are suspicious. Overall, it's Ben's interactions with the rest of the cast that give Ban Man its own distinctive flavor. Auerbach weaves a panoply of threads within his plotlines and creates a multilayered mystery which surrounds Eric's disappearance. He does his best to be misleading and each new storyline throws the reader onto various false trails. When all is said and done, Bad Man is so convoluted that it seems that even the author lost control of the plot. There are simply too many lose ends for the ending to be really satisfying. True, the novel keeps you guessing till the very end. And yet, with so many seemingly important elements turning out to be unanswered questions, chief among them the identity and motivations of the blond boy and the mystery surrounding the Blackwater School, you are left with little or no resolution regarding a number of storylines. Too many, to tell the truth. And this robs the ending of the impact Dathan Auerbach obviously wished for. Bad Man also suffers from pacing issues. Weighing in at only 320 pages, it's a relative short work of fiction. And though it's meant to be a slow-burn kind of book, at times the rhythm is atrocious and it feels as though you are reading a much longer novel. All in all, although it had great potential, Bad Man reads like a debut. Which, honestly, it is, as Penpal was self-published. It's obvious that Dathan Auerbach has what it takes to become a popular horror writer. If he can focus on what he does best and avoid the pitfalls of trying to make everything too complex for his own good, he could become one of the genre's big names in the near future. Having said that, horror fans in the mood for an ominous setting, flawed characters, and a creepy mystery will find a lot to love about Bad Man. I'm looking forward to whatever Auerbach will write next.